It’s that time of year, again, when you pull out the sweaters and snuggle in for cooler days. Fall is here, and while the thrill of summer is gone it doesn’t mean that family fun has to end. With many kids heading back to school and restarting extra-curricular activities, many families feel strapped for time during this busy season, but you don’t have to dedicate enormous amounts of time to create fun family memories. Grab a camera and add these 20 family activities to your fall family bucket list. 1. Decorate a pumpkin. Many families carve jack-o-lanterns in preparation for Halloween, but painting is just as fun and much safer for little hands. 2. Go to a corn or hay maze. 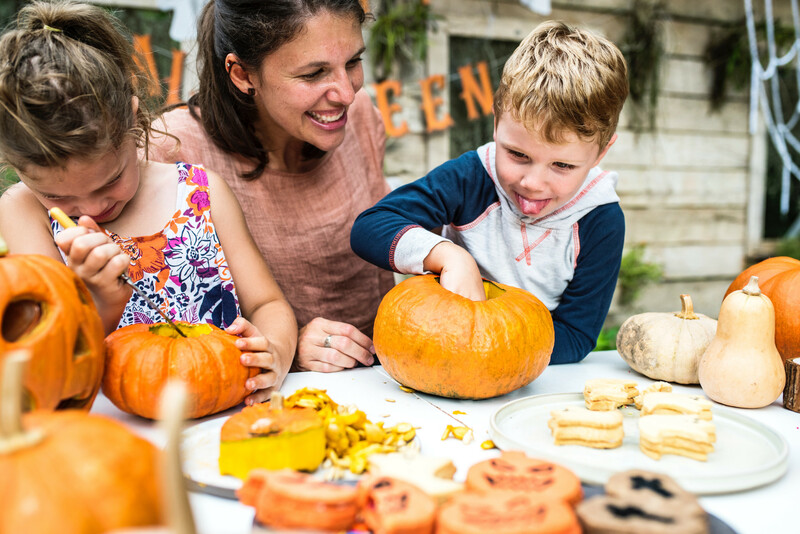 You may see these fun family friendly challenges pop up during September and October. They’re a great way to spend an autumn afternoon. 3. Make caramel apples. Jazz up your apples by topping them with chocolate chips, mini marshmallows, and candy pieces. 4. Press leaves. Preserve the colors of fall by searching for extraordinarily bright leaves, pressing them under two or three heavy books for a week, and saving them in a memory book. 5. Attend a football game. Fall means American football. You don’t have to shell out the cash for a pro-team however. Hit up a local high school or college game and cheer on your local players. 6. Snuggle in for story time. Take advantage of a rainy day by pulling out the blankets and reading a good book as a family. 7. Go on a nature walk. Enjoy nature’s changing colors by bundling up and going for a walk. Challenge your kids to an animal scavenger hunt to keep them engaged. 8. Bob for apples. This old-time game is a little unsanitary for a large group, but it’s perfectly suited to a family night. 9. Check out a family friendly haunted house. Many haunted houses cater to families exclusively or offer kid appropriate hours each day. Getting scared is always more fun when you’re with those you love. 10. Create a thankful tradition. Use the entire month of November to count your blessings. Make a simple thankful tree or paper chain that you add blessings to each day in November. 11. Play in the leaves. Raking doesn’t have to feel like a chore! Rake all those leaves into big piles and allow yourself to act like a big kid. 12. Go on a hayride. Find a company that offers hayrides, and bring the family along. Take in the beautiful fall leaves without having to walk, which is perfect for families with young children. 13. Start planting for next spring. Summer is over, but that doesn’t mean the gardening should stop. Plant daffodil and tulip bulbs for next spring on a lazy Saturday morning. 14. Bake a pumpkin dessert. Whether it’s pumpkin pie, pumpkin cookies, or a pumpkin roll, take advantage of fresh pumpkin season by whipping up a yummy dessert. 15. Go trick-or-treating. There’s only one day a year where you can get all the free candy you can eat. Make it a family affair by going together. 16. Bird watch. Fall is migration season, so take an afternoon to watch all the birds flying south for the winter. After all, you won’t see them again until spring. 17. Create your own Halloween costumes. You don’t have to be an expert seamstress or tailor to put together something fabulous. 18. Enjoy a big pot of chili. Nothing says fall like a big pot of steaming chili. Make chili on the first day of fall for a new family tradition. 19. Make a bird feeder. Feed the winter birds that stick around with a simple pine cone and peanut butter bird feeder. 20. Play a game of two-hand touch. For the active family, play two-hand touch football as a family. This tradition is a great warmup to your Thanksgiving feast. Try out one or try them all, either way makes some great family memories this fall. Many of these activities will become cherished traditions that will live on for generations. See more seasonal family fun articles from Famifi here.